The rains have brought many weeds! WWC needs your TLC with some easy weeding this weekend. Join us for Coastal Clean up Day on Sat. Sept. 19! Help make a difference! Keep SF Bay clean before El Niño rains drag plastics and other bad things into the Bay and ocean this winter! SF Bay east coast of SF needs more help than the ocean beaches and has more trash! Youth volunteers (18 and under): Bring a parent-signed waiver. Proper clothing - closed-toe shoes (no sandals), sunscreen, hat, and layers. Your own reusable supplies but we will have bags and gloves if you need them! Limit waste by bringing your own bag or bucket, gloves, and water bottle if you have them. 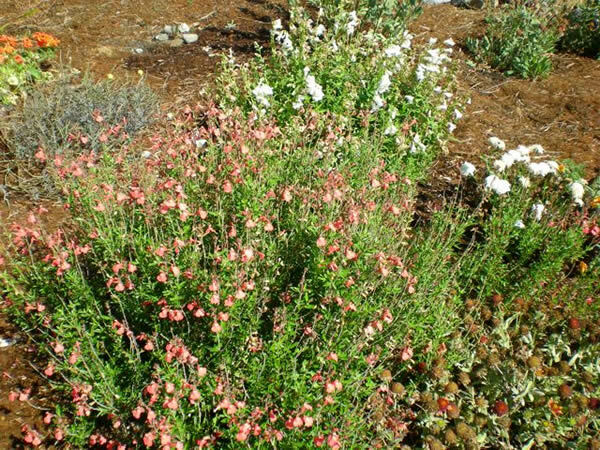 CONSERVE–BYO this year! Next 4th Saturday at Warm Water Cove will be in October! Warm Water Cove Park on 24th St. at the Bay, Dogpatch. T-Line 23rd St. stop, walk 1 block south to 24th St., then 2 blocks east to the bay and park. Free, easy parking too! BYO water to drink. We supply gloves/tools/snacks and usually a "door prize" from a local merchant/sponsor. Last month a lucky volunteer received two tickets to Dogpatch's Museum of Craft and Design. Thanks! 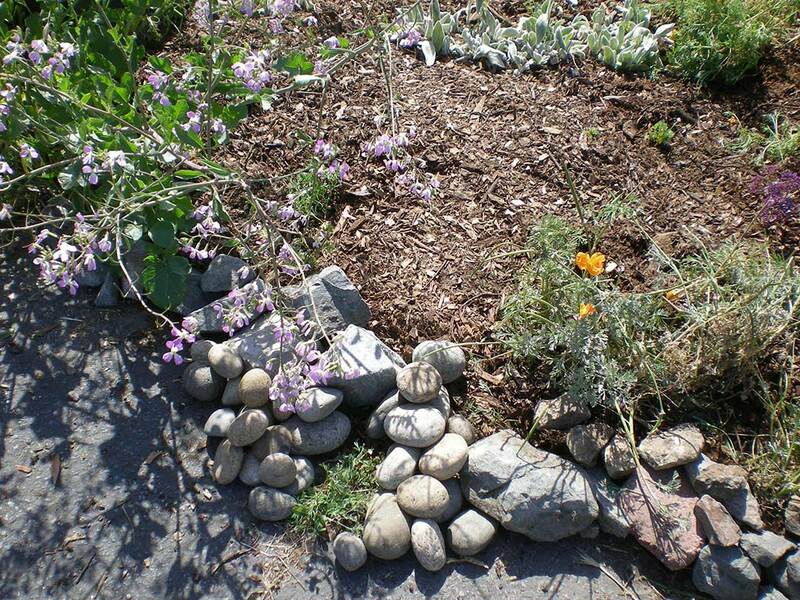 A grant from GreenTrustSF paid for the City's Sidewalk Garden Permits for participating property owners. Volunteers needed! 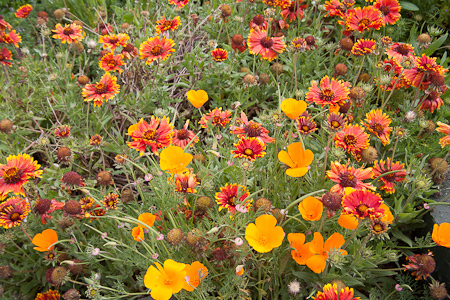 Please join GTSF, FUF and neighbors on Oct. 23/24/25th to plant the gardens! 9 am- volunteers meet at 934 Minnesota St, just north of 22nd St.
We will amend the soil with compost and mulch the gardens on Minnesota. We will also be installing some decorative boulders. Plants will be delivered 907 Minnesota St- I will confirm the exact time window on Thursday. If any property owners are around in the morning it would be great to have a hand with getting the plants into the garage. 9 am- Volunteers meet at 907 Minnesota before walking around the block to 22ndstreet gardens and Tennessee street gardens. Same activities as Thursday. 9 am- volunteers meet at 934 Minnesota st for Planting Day!! We will have coffee and pastries to start the morning, as well as a few words from FUF. Regular 4th Sat. Garden Day for Sept. is canceled so we can join Coastal Cleanup Day on the 3rd Sat. Sept. 20. See you there! Warm Water Cove Park on 24th St. at the Bay, Dogpatch. T-Line 23rd St. stop, walk 1 block south to 24th St., then 2 blocks east to the bay and park. Free, easy parking too! BYO water to drink. We supply gloves/tools/snacks and usually a "door prize" from a local merchant/sponsor. Warm Water Cove is looking great with this recent rains. Things were bursting in March! Wild flowers everywhere. Our volunteers did a great job on the middle garden and one lucky person took home a $20 Gift Certificate "door prize" to Potrero Hill's Good Life Grocery! Please patronize our sponsors. They appreciate your business and we appreciate their support. In January and February we weeded and mulched, and gave two $25. gift certificates from Goat Hill Pizza to our door prize winners! Just For You Parklet is Open for You! 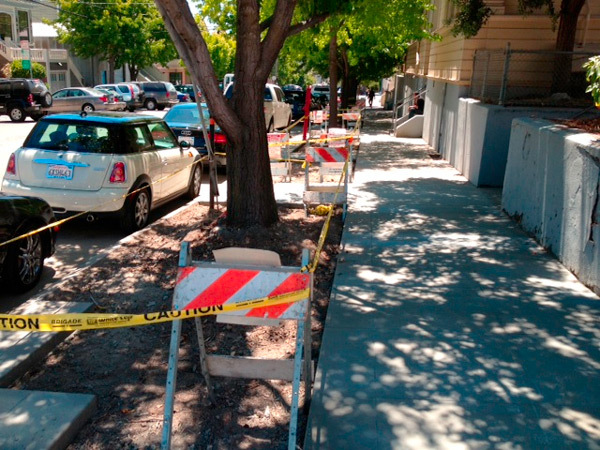 Grab a coffee or something to read or just watch the street activity from your Dogpatch parklet at 732 22nd St. Open now, 95% done…just waiting for the potted plants and you! 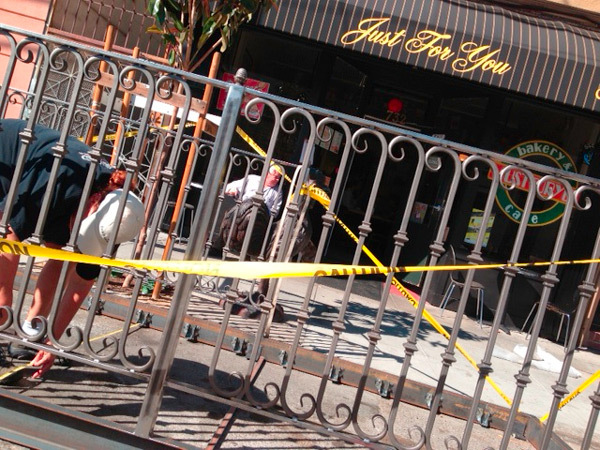 Thanks to generous donations to GTSF and Just For You Cafe for the Parklet from people like you.See more on News page. 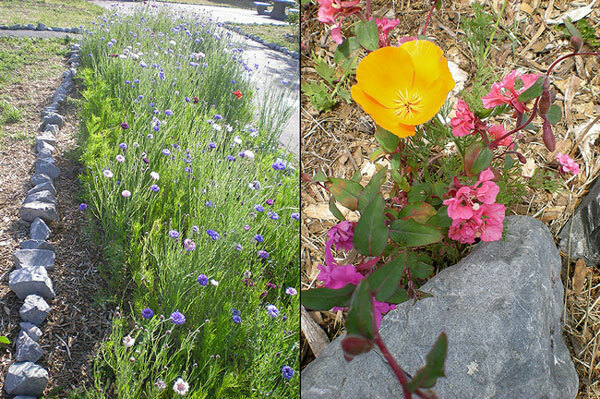 We weeded in Oct. and are adding new CA Native plants to the gardens on Sat. Nov. 23, 2013 10:30am-12:30pm. See more on News page. GTSF is helping to create planted sidewalk areas on both sides (Tennessee St. and Minnesota St.) of the historic Scott School at 1060 Tenneessee St. just in time for winter rains! Stay tuned for more. GTSF has been working with Madrona Landscape Design, Bay Natives nursery and MUNI MTA on this little garden in the front of the park. 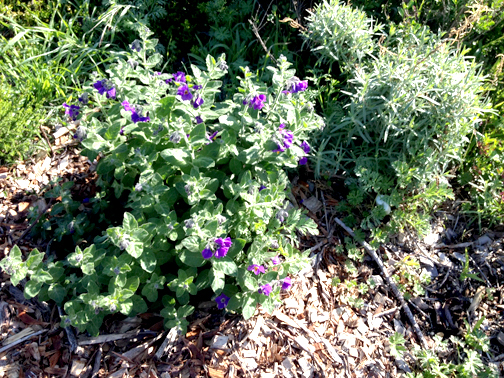 We have planted CA native plants (including the spring blue flowering Ceanothas shown in photo, to bring natural habitat for local butterflies, bees, other insects and birds. A local parents' group is fundraising to bring a children's parkland more garden to the current sand pit behind the garden. See their latest information on Nextdoor Dogpatch. 4th Saturdays continued with great results through July and August. Join us for our first 4th Saturdays Garden Day. 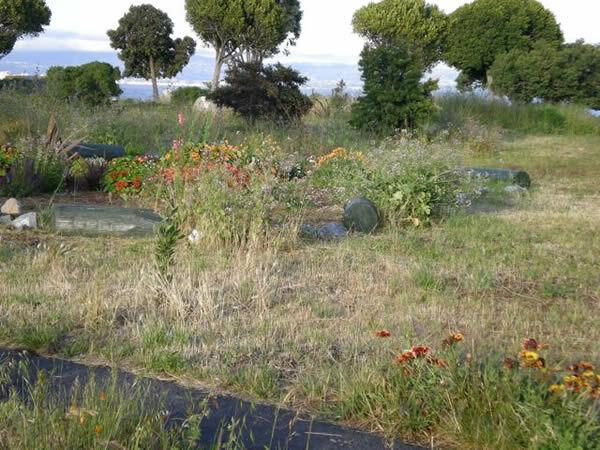 Gardening and cleanup Sat., July 27, 10 am-12:30 pm at Warm Water Cove Park. Bring water to drink, closed-toe shoes. We provide tools, gloves, light snacks and perhaps a door prize! We will be here Every 4th Saturday of the month, same time and place so mark your calendars and come on out! Third St. T line stop at 23rd. walk 1 block south to 24th St., 3 blocks east to the Bay. 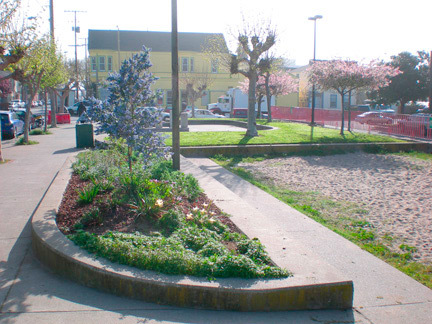 Free parking at Park- 24th St at the Bay, 2 blocks east of Illinois St.
GreenTrustSF is partnering with Just For You Cafe, to help them raise donations for a public parklet in Dogpatch in front of the cafe on 22nd Street between Third St. and Tennessee St. this summer! The design is approved and permitted. 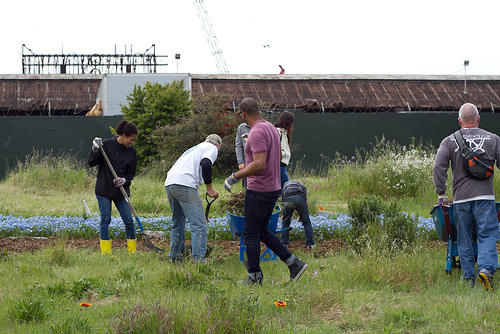 GreenTrustSF is offering a challenge grant of $2000. Donations will go through our donation page at San Francisco Parks Alliance. Look for more News on that soon! Please join us and enjoy your park! 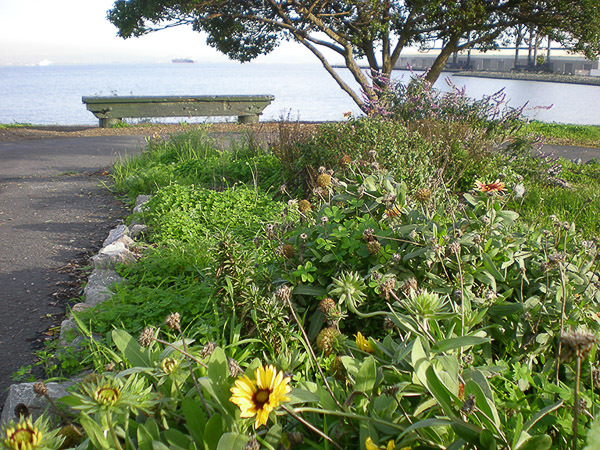 Join GTSF and your green neighbors for gardening, weeding, mulching with Bay views Saturday, April 27, 10:00am-12:30pm. 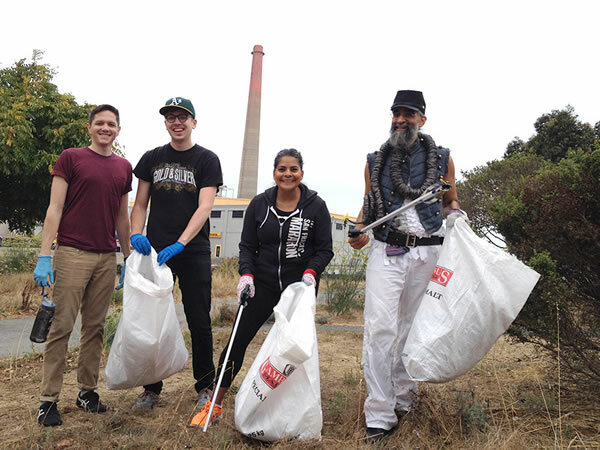 GreenTrustSF continues to steward Warm Water Cove Park with our neighbors in Dogpatch, Central waterfront and elsewhere. Please join us on Feb. 23, Saturday, 10:30am-1:00pm. GreenTrustSF and neighbors continued winter rejuvenation at Warm Water Cove Park on Feb. 10, 2013 by planting 15 new CA natives in the middle south garden. It was a beautiful sunny day for weeding, planting and mulching accompanied by an impromptu music event elsewhere in the park. Topped off by fabulous door prizes from our local business friends on 22nd Street in Dogpatch: Rechuitti ChocolateLab and Caffe La Stazione! Please join us on Feb. 10, Sunday and Feb 23, Sat. 10:30am-12:30pm. 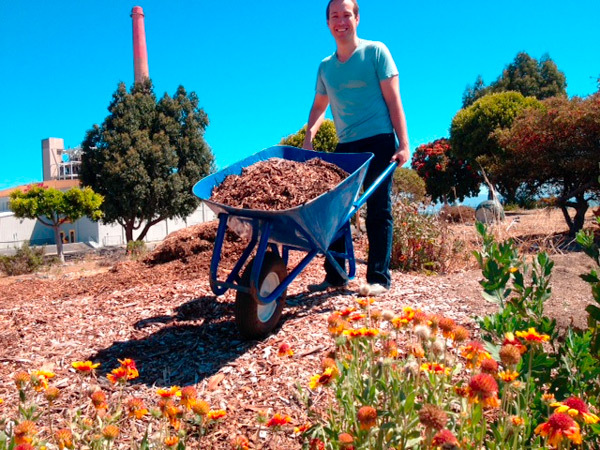 GreenTrustSF and neighbors Plant CA natives with soil from Recology, soil amendments from Bay Natives,mulch from the Port of San Francisco and snacks and prizes donated by neighborhood businesses! GTSF thanks one and all for joining us at our Warm Water Cove Park Winter Rejuvenation 2012/2013 No.1, Sat., Dec. 15, 10:30am-12:30pm. We accomplished a lot in 2 hours: amended 9 yards of soil, weeded, planted and mulched 18 new CA native plants all just before it started raining. Perfect timing! The plants will do well with this rain. Congratulations to Stephen, Patrick and Steven, our door prize winners of great gifts from Just For You cafe, Rickshaw bags and Sutton Cellars! And many thanks to Good Life for the snacks, and to Recology for the dirt, SFDPW for removing the dumped trash before we arrived, the Port of SF for the tools and water, Bay Natives nursery for the soil amendments, HANC SF native plant nursery and Flowercraft nursery for the discounted plants. What a generous community! To get there: T Third MUNI bus stop at 23rd St. Walk one block to 24th St., walk 2 blocks east to Bay. Free parking also. We are having an impromptu work party at Warm Water Cove this Saturday 10am-noon. Please join us and bring your own drinking water/beverage and garden gloves and hand garden tools if you have them. 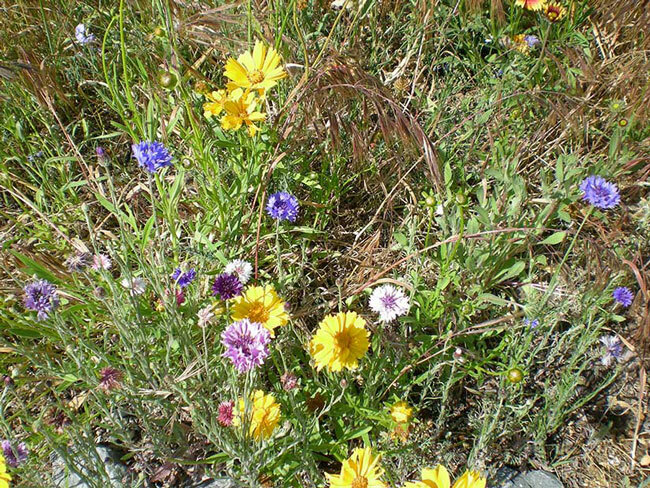 We will be weeding, watering, picking up trash, realigning the rock borders, and enjoying the views, water and flowers. We will have some extra gloves and tools. Hope to see you there! At the east end of 24th Street at the Bay, 3 blocks east of 3rd St. T-Line stop at 23rd St. and free parking, Dogpatch neighborhood. Coastal Cleanup Day at Warm Water Cove on Sept. 17, 2011 leaves the Cove looking CLEAN! but dry as the summer moves into fall. 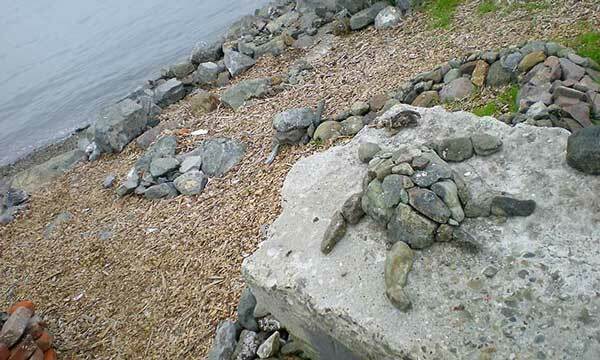 Volunteers enjoyed the Bay views and Earth Art while cleaning up the Cove. Read more in News. Stay tuned for upcoming planting, weeding and mulching days this fall and winter! Warm Water Cove continues to Bloom with different flowers every month! Read more on the News page! If you were at the recent Earth Day workday at Warm Water, you saw the Blue Greenway’s idea board. Warm Water Cove is embedded in the Blue Greenway. 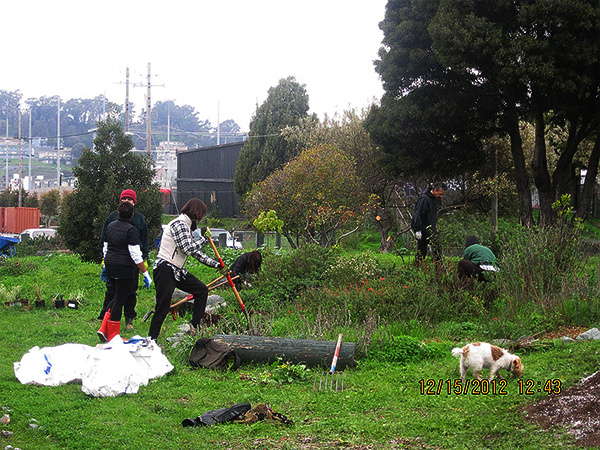 The volunteer activities at the Cove have been organized through GreenTrustSF, since 2007. Warm Water Cove is under the jurisdiction of the Port of San Francisco. 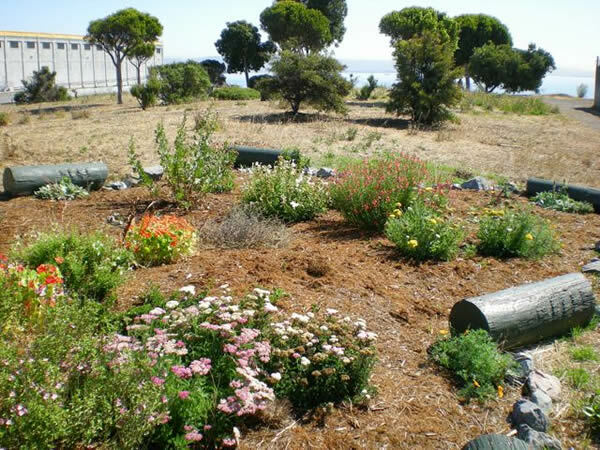 The Port has been supporting the efforts of GreenTrustSF at WWC Park and is also working with the NPC on the Blue Greenway initiative. 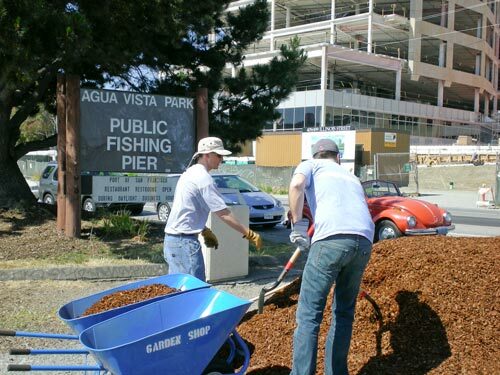 The Port provides tools and other support for volunteers at events like the recent Earth Day work party. 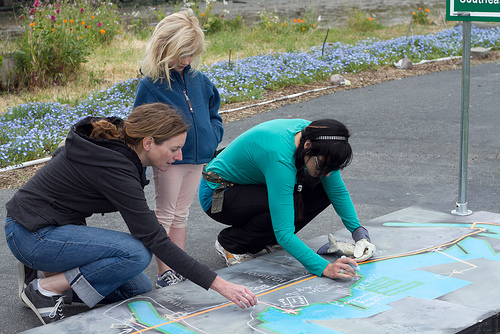 If you are interested in the Warm Water Cove Park revitalization and ongoing stewardship and the whole Blue Greenway or any other part of it, plan to attend either or both of the upcoming meetings at the Port offices on Pier 1 (Embarcadero @ Washington) from 6:00 to 8:00 PM. signage program and the revised Site Furnishing standards. Two dozen hard-working neighborhood volunteers, Burning Man friends and Supervisor Malia Cohen and her aide Megan Hamilton joined GreenTrustSF, Progress Park neighbors and the Port of SF for a festive morning of compost/soil distribution, wild flower sowing, dirt tamping, mulching and watering of 5 new wildflower beds along the paths in Warm Water Cove Park (24th Street at the Bay). The weather was exquisite, the tide was low and hundreds of seagulls were noisily enjoying a feast of herring roe on the newly cleaned shoreline, thanks to the Jan. 8 clean-up by Sea Scavenger. Volunteers made short work of the mountain of compost/soil after lining the beds with weed-suppressing newspaper. Buoyed by Blue Bottle coffee by Piccino and juice and snacks from the Good Life, and the lure of a Mr. & Mrs, Miscellaneous Ice-cream cone afterwards, the beds were seeded and watered by noon. Later augmented with CA and SF native plants from HANC SF Native Plant Nursery and other select drought-tolerant, bee, butterfly and bird attracting plants from Flowercraft Garden Center, the beds have started to sprout with the warm weather we have had since the event, with a little watering help from GreenTrustSF Board of Directors. Everyone, from kids to seniors, enjoyed the morning while meeting new people, chatting with their neighbors and learning a bit more about community gardening. Everyone is encouraged to visit the park and see the flowers bloom. It should be a colorful spring and summer. Warm Water Cove Park is a great place for walking, bicycling and sitting down to enjoy the Bay view, birds and occasional seal gliding through the water. Thanks to everyone for their contributions and support. 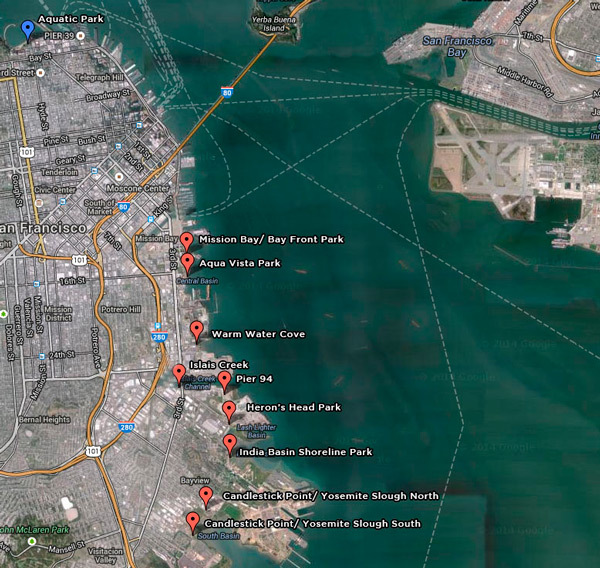 Join Sea Scavenger, GreenTrustSF, your neighbors and other volunteers for a shoreline cleanup of Warm Water Cove Park. Sat. Jan. 8 10:15 am -12:00 noon. Meet at the park at the eastern end of 24th St., 2 blocks east of Third St. (Other volunteers will meet at the Junior Giants Field at Mission Creek but Dogpatch neighbors just need to walk over to the park. Gloves and bags provided. Please bring your own drinking water. After cleanup, we will car-pool to party at and sponsored by Thirsty Bear Brewing Company. See more at http://www.seascavenger.org/sanfranciscoshorelinecleanup.html rsvp to info@seascavenger.org (preferred) or just show up. 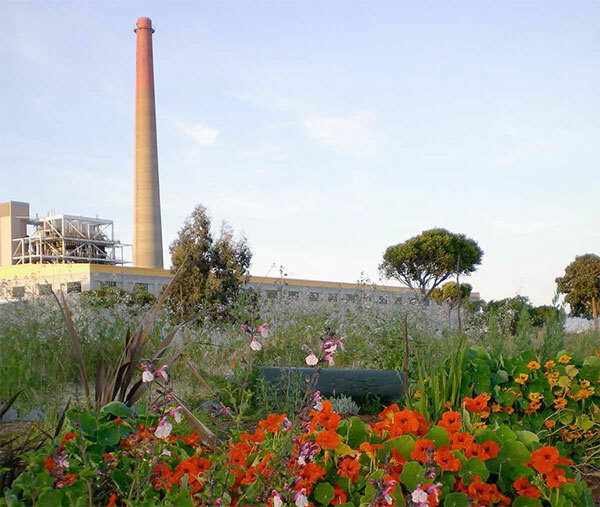 The final draft of the 22nd Street Greening Master Plan was presented at the Dogpatch Neighborhood Association meeting and is now being completed. The Plan will be published and available as a pdf on this website and for download in early January, 2011. See a presentation of the plan by David Fletcher of Fletcher Studio Landscape Architecture and Urban Planning, at the Dogpatch Neighborhood Association meeting on Tuesday, Nov. 9, 2010, 7-9 pm at 654 Minnesota Street, SF 94107 (cross street: 19th St.) The 22nd Street Master Plan and future Green Blueprint are intended to assist property owners, developers, and neighbors plan for and create new green spaces. They will add to everyone’s enjoyment of the greater Central Waterfront neighborhood. An enhanced green infrastructure will also provide habitat for birds, butterflies and other wildlife, and will help to mitigate storm/rain run-off by increasing the amount of unpaved land. The Board of Directors of GreenTrustSF thanks the 50+ neighbors and friends of the 22nd Street (Dogpatch/Central Waterfront) Greening project who joined GreenTrustSF and Fletcher Studio for the second community workshop on January 23, 2010. Parking/Traffic/Circulation -Explore the possibility of using diagonal parking along 22nd Street and adding additional parking under 280. -The Muni stop at the SE corner of 22nd and Minnesota could be moved to the SW corner, or in front of the Muni park. -Individuals expressed interest in installing permeable driveways in front of their properties. -10 minute parking signs could help with the double parking conflicts. - Several attendees expressed concern if there would be a significant loss of parking places on the street depending on which plan is implemented. Storm Water Drainage -Concerns about current drainage problems at 22nd Street and Tennessee. A community member suggested a soil sample for the clay-rich soils and dry wells for overflow protection. 280 Freeway CalTransOverpass -The space beneath the overpass could be a community art project with lighting and murals. The Black Rock (Burning Man) group was mentioned as a possible consultant for the art work. -Several attendees expressed concern about the problem of encampments under the freeway, and said more secure fencing would be helpful. CALTrain Station - One attendee suggested the wooden bridge over the railway was a nice old historic remnant and should be "fixed up." 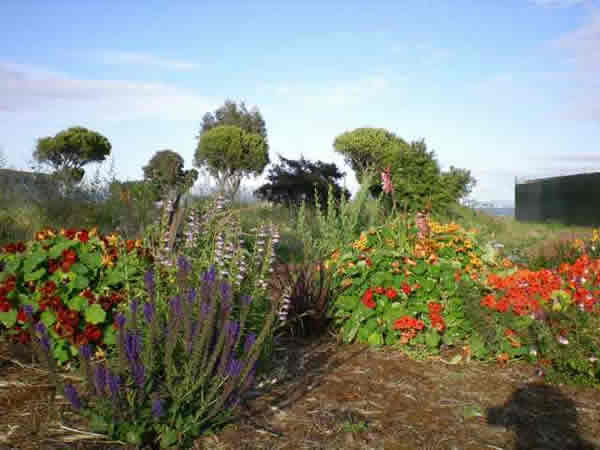 The gardens are thriving in their first year thanks to GreenTrust members, neighbors and SF Port gardeners who have been watering and weeding to help the gardens get established in their first year. 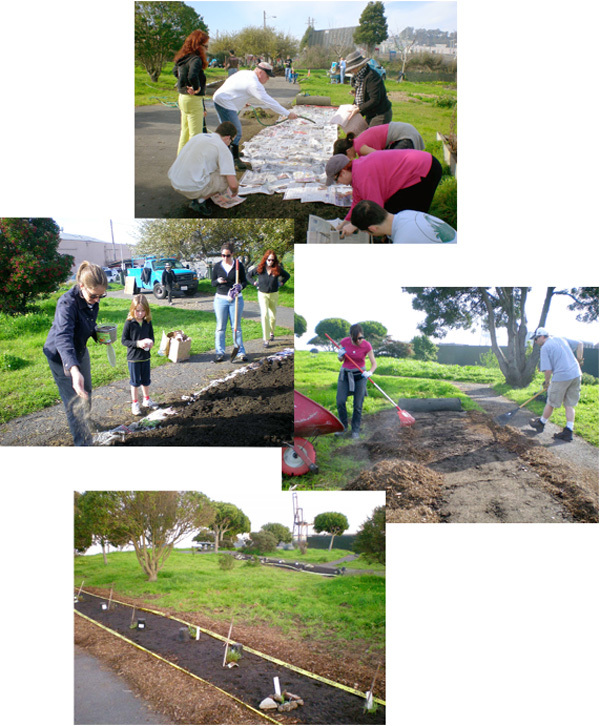 With a successful second annual Coastal Cleanup Day project at Warm Water Cove Park, GreenTrustSF has an ongoing commitment with the Port of San Francisco to monitor and nurture the new gardens which were planted by our community volunteers during the September 2008 Coastal Cleanup Day Event hosted by GreenTrustSF, the City's Community Clean Team and the Port of San Francisco. The event was supported by many neighborhood businesses and residents. In our second year of partnership with the Port, Warm Water Cove Park is becoming a more inviting, cleaner and friendlier park where people come to bike, walk and enjoy the waterfront. Located 1 blocks south and 2 blocks east of the 23rd St. Lt. Rail stop, the park is easily accessible to all. Click here for more info. and photos. 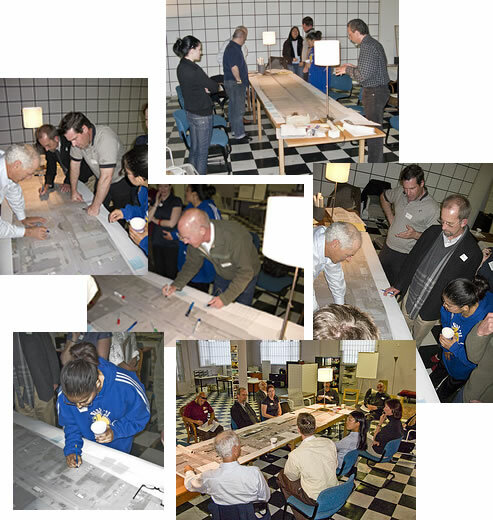 GreenTrustSF organized and sponsored an exciting evening neighborhood design workshop on April 3, 2008 to discuss streetscape improvements that could be made to 22nd St. from Third Street to Pennsylvania Street. Participants enthusiastically generated a host of ideas and supported pursuing long-range improvements and greening along 22nd Street, east to west, from Illinois St. to Missouri St. and to further extend that connection to the waterfront on the east and up to Potrero Hill on the west. 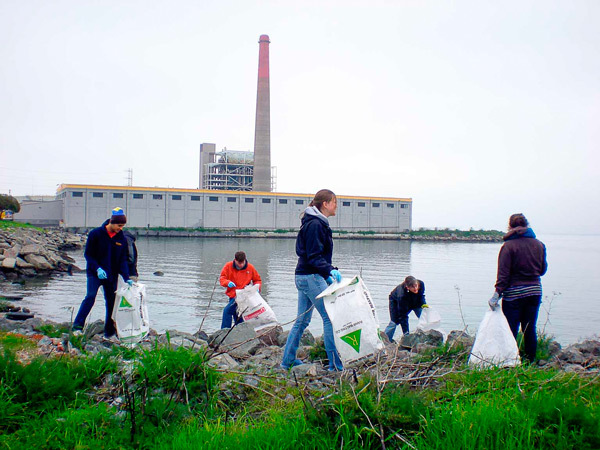 On a sunny August 4th, 2007, 120 volunteers descended upon the neglected, grafitti-covered patch of waterfront park known as Warm Water Cove, that starts where 24th Street ends as it heads toward the Bay. And what a party it was! With great music helping things along and in a matter of hours, 750 lbs of debris and 5,000 lbs of weeds were removed, 30 yards of chips were spread and 18 trees trimmed and/or re-staked. Then the painters, moving in well-orchestrated small bands, began covering over 46,000 sq ft of graffiti vandalism on private property walls & fences. By 11 am the place had been transformed. In this very well coordinated effort, sponsored by DPW and SFConnect, along with the newly created GreenTrustSF, all of this out-pouring of community was topped off by a huge BBQ, all donated, which fed the small army of 200 that had gathered. And in the end, after the meal, the assembled volunteers and DPW employees gathered as the park was officially blessed during a lovely Native American ceremony honoring the four directions. As part of the hoped for transformation and blessing, the assembled and now well-fed crowd, one-by-one spread 200 pounds of native wildflower seeds in handfuls or cupfuls throughout the newly cleaned and polished park. Now to all those who have never even stepped foot on this secluded piece of bayside open space, grab your picnic and go! Dogs are also welcome. Warm Water Cove is likely to figure big in the future as part of both the BlueGreenway and Bayside trail. Keep the place alive and make it the spot for your next outdoor gathering!